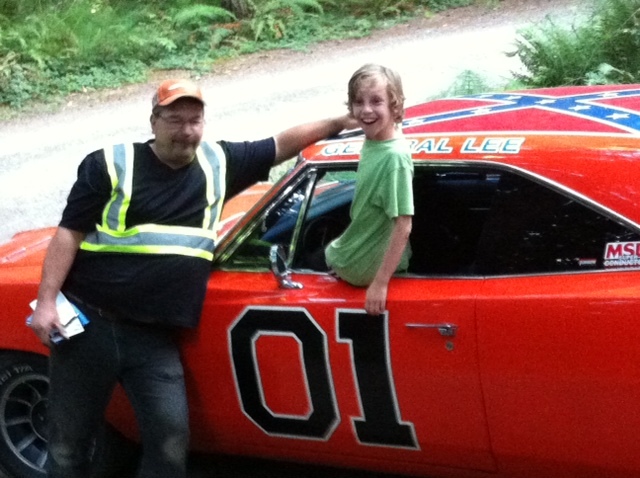 Canadian Rebel redneck Darcy Vickery shows off his General Lee to my son, Michael. Yes, I’m talking about a full-blown re-creation of the “General Lee” race car from The Dukes of Hazzard TV show. Like the original, this General Lee has a souped-up engine, a horn that toots the opening notes of “Dixie,” and a Rebel flag painted on the roof. We met the owner of the General Lee this summer on Pender Island, one of the Southern Gulf Islands in British Columbia. Our usually reliable old VW “Westy” camper had refused to start at the local farmer’s market. So there we were, sitting in Coleman chairs in the shade, playing cribbage and hoping that the only mechanic on this tiny rural island would return a plea for help left on his cell phone on a Saturday. Darcy Vickery eventually called and said he was on his way. After a while, Darcy pulled up in his wrecker. He stuck his head under the hood of the van and methodically diagnosed our problem: a fried starter coil. With any luck, Darcy said he might be able to get a buddy to retrieve a replacement part at an auto store in Victoria, a ferry ride away. In the meantime, Darcy agreed to tow us back to our campground and drop us off. If he could get the part, he said he would come back later and install it. My wife and son and I piled into the cab of the wrecker on the way to the campground, and I made small talk. I told Darcy that my cousin was a mechanic who had a similar tow truck he used to rescue the race cars that tumbled over the banked curve at the dirt track in my hometown. Darcy said he was a big racing fan and a Mopar man. He wondered if we knew about The Dukes of Hazzard, the cornpone TV series from the 1980s. Well, Darcy said he owned a replica of the Dodge Charger that starred in the show. Just maybe he might drive it later when he came by to fix our van. My 9-year-old son grew giant saucer eyes of anticipation. Just after Darcy unhooked our van at the campground, I said don’t make a promise you can’t keep. A few hours later, we heard the sound of the Charger and a blast of “Dixie,” and I knew Darcy was a man of his word. He had the new starter coil. And he was driving the General Lee! He parked and we huddled around the car. He showed off the super-charged engine and let my son sit in the driver seat. It was apparent he had painstakingly restored his baby with every detail, including hand painting the Confederate flag that stood out like a giant X on the rooftop. I grew up in North Carolina. It can be genteel place where strangers say hi on the street. It’s a place where it’s OK to drop in unannounced for a visit and not unusual to be invited to stay for supper. It’s also not unusual to see some of the more overt signs of a darker pass, including displays of the Confederate flag. For many, the Stars and Bars is a racist symbol of hate and intolerance. I may be making excuses for the guy who helped rescue our vacation. But I don’t think Darcy has the cultural experiences of an American to really grasp the racist subtexts of symbols like Confederate generals and Rebel battle flags. Sure, he knows the Confederate flag is offensive to some. He said he has been harassed by a few people on Pender, mostly tourists from the States, who wanted him to paint over the roof of his General Lee. One guy threatened to complain and get Darcy’s towing contract with the Canadian Automobile Association revoked. But nothing ever came of it. Darcy said his is not trying to make a statement, or offend anyone. The General Lee is just his way of recalling a TV show he loved watching when he was growing up. The show helped fuel his interest in cars, especially muscle cars like the hotrod he has transformed into his own 425-horsepower slice of the American South. Despite being Canadian, Darcy said he fells like a proud Rebel redneck. Maybe he was just born in the wrong place. After getting our VW up and running, we exchanged high fives and said our goodbyes. Darcy fired up the Charger and drove out of the campground. As he hit the blacktop and gave it the gas, we heard the General Lee roar one more time, accompanied by a loud blast of “Dixie” of course.